I recently found an online baking group called Tuesdays with Dorie, which is a group of bakers making their way through Dorie Greenspan's Baking: From My Home to Yours, one recipe per week. I decided it would be a great motivational tool for me to get baking, so I joined up! Although I used parchment dusted with potato starch as the recipe suggested, it still took me forever trying to scrape the marshmallows away from the paper. I think next time I'd put some sort of grease in there too... maybe Baker's Joy on top of the parchment. One last shot before the recipe! GETTING READY: Line a rimmed baking sheet -- choose one with a rim that is 1 inch high -- with parchment paper and dust the paper generously with potato starch or cornstarch. Note: I used a 9x9 square pan to make mine pretty tall. Have a candy thermometer at hand. Put 1/3 cup of the water, the sugar and the corn syrup in a medium saucepan over medium heat. Bring the mixture to a boil, stirring until the sugar dissolves. Once the sugar is dissolved, continue to cook the syrup -- without stirring -- until it reaches 265 degrees F on the candy thermometer, about 10 minutes. Using a large rubber spatula, scrape the meringue mixture onto the baking sheet, laying it down close to a short end of the sheet. Then spread it into the corners and continue to spread it out, taking care to keep the height of the batter at 1 inch; you won't fill the pan (unless you are using a 9x9 pan!). Lift the excess parchment paper up to meet the edge of the batter, then rest something against the paper so that it stays in place (I use custard cups). 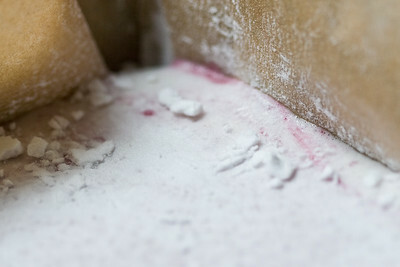 Dust the top of the marshmallows with potato starch or cornstarch and let the marshmallows set in a cool, dry place. They'll need about 3 hours, but they can rest for 12 hours or more. 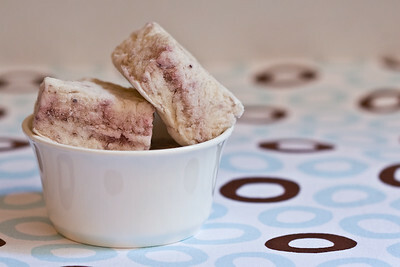 RASPBERRY MARSHMALLOWS: Fruit purees are excellent for flavoring these candies. 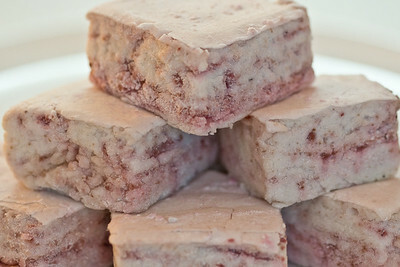 For raspberry marshmallows, you'll need a generous 1/3 cup of puree; reduce the vanilla extract to 1/4 teaspoon. After the batter is mixed, gently fold in the puree with a rubber spatula. You can use the same measurements and technique for other purees, such as strawberry, mango and passion fruit. CAPPUCCINO MARSHMALLOWS: Sift 1/4 cup unsweetened cocoa powder, 2 tablespoons instant espresso powder and 1/2 teaspoon ground cinnamon together into a small bowl. Stir in 1/3 cup boiling water and mix until smooth. Reduce the vanilla extract to 1/2 teaspoon, and add it to the espresso mix. After you add the sugar syrup and gelatin to the meringue, beat in the espresso mixture and continue. LIGHT CHOCOLATE MARSHMALLOWS: Melt 3 ounces bittersweet or semisweet chocolate and stir in 2 1/2 tablespoons unsweetened cocoa powder. Reduce the vanilla extract to 1/4 teaspoon, and after the marshmallow batter is mixed, fold in the chocolate mixture with a large rubber spatula. PUMPKIN SPICE MARSHMALLOWS: Whisk together 1/2 cup canned unsweetened pumpkin puree, 1 teaspoon ground cinnamon, 1/2 teaspoon ground ginger, a pinch of freshly grated nutmeg and a pinch of ground allspice. After the marshmallow batter is mixed, fold in the spiced pumpkin with a large rubber spatula. That's it! Thanks to TWD for having me, I hope to make lots more delicious treats this year ;) Check out the TWD page to see everyone else's photos and experiences! Your marshmallows look really scrummy! Well done! I love your presentation as well. I made peanut butter cookie s'mores with mine. thanks Marie! i just left a comment on yours, great idea with the s'mores... yum! I love the fact that you made mixed berry flavors. they look great! I love the berry flavors! These look delicious! I bet they were wonderful! Welcome to TWD! Your marshmallows look fabulous! You've done a fabulous job, and I love the idea of mixed berry marshmallows! Well done on your first go! They look AMAZING! Welcome & great job!! 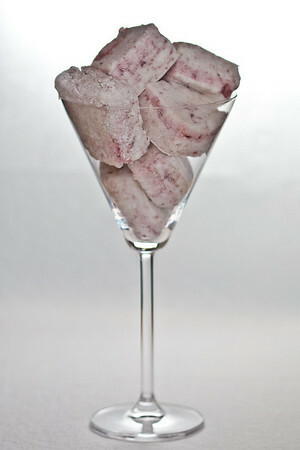 Oooo...Mixed Berry Mallows sound absolutely divine! I almost used parchment paper, but decided not to at the last minute. I'm glad I didn't now. But it looks like you got yours out OK! These do look scrumptious. Excellent job! Great pictures! Blueberry, raspberry & blackberry marshmallows sound delicious. I love them displayed in the martini glass! They look delicious, I love the swirls! Yum! I love the photo of the marshmallows in a glass. I did a similar shot with a large wine glass. Yours are so pretty! The photos look great! Welcome to the group!